Spring and summer are known for being moving season –– everyone shakes the dust out of their homes, apartments and condos, and looks for new living spaces. Hiring a moving company, however, can be a costly project, as can purchasing a new home and finding a buyer for your old house. Save yourself the stress, anxiety and expense by giving your Durham, NC home a summer facelift instead. 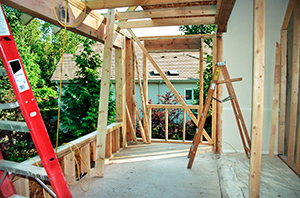 If you’re thinking that you don’t have the time to invest in redoing your home, not to worry –– that’s where the home remodeling experts at Gerald Jones Company come in. Our Durham home contractors are capable of completing a number of services that will transform your house into the living space you’ve always wanted, without hiring expensive moving services, or spending hours packing and unpacking boxes. Door installation. Changing the entry point on the front of your home can drastically alter your home’s facade. Whether you’re looking for a front, patio, storm or security door, Gerald Jones has the diverse options you’re looking for. Replacement windows. Windows can drastically alter your home’s look, as well as its energy consumption levels. Consider adding a bay or glass block window to change up your view, inside and out. Sunrooms, decks and screened porches. Bring the outside inside, without invading bugs and sticky tree sap, when you invest in any one of Gerald Jones’ customizable outdoor living solutions. Our home contractors can install sunrooms, screened porches, decks and more to extend your entertaining and lounging space, ultimately boosting the value of your house. With more than 60 years of experience in the home remodeling and improvement industry, you can be sure that no matter your Durham summer project choice, you’ll be satisfied with the results from our expert contractors. Take a look at some of our previous projects, read through customer testimonials, and then call Gerald Jones Company today at 919.286.1700 to request your free construction consultation. This entry was written by geraldjones, posted on May 22, 2015 at 7:52 am, filed under Uncategorized. Bookmark the permalink. Follow any comments here with the RSS feed for this post. Both comments and trackbacks are currently closed.